Lee Wen, More China than You, 2012, vinyl stickers, video, velvet curtain, dimensions variable. Installation view. Lee Wen is no coward, though he is famous for being yellow. In his ongoing “Yellow Man” series, the Singaporean performance artist is seen in videos and photographs with canary-yellow poster paint smeared all over his body. The photograph Strange Fruit, 2003, for instance, shows his jaundiced frame on a beach. Since red Chinese lanterns dangle over his face in these works, Lee’s identity is further obscured. The whys and wherefores of his colorful goings-on—tongue-in-cheek riffs on stereotypical readings of Chineseness —are examined in “Lucid Dreams in the Reverie of the Real,” Lee’s current midcareer retrospective, which boasts his photographs, installations, and videos from the past twenty-five years. More China than You, 2012, takes bold potshots at authority—slyly suggesting a similarity between the city-state’s so-called socialist democracy and Red China’s restrictive policies. 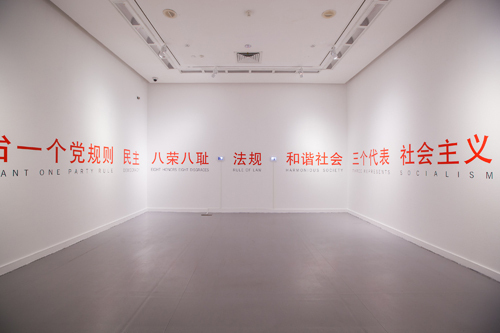 Visitors enter a suffocating, windowless room, on the walls of which crimson vinyl stickers spell out political slogans, such as HARMONIOUS SOCIETY; ONE PARTY, TWO SYSTEMS; and RULE OF LAW. With World Class Society, 1999–2000, Lee makes even more not-so-fond fun of political propaganda. Viewers peer through a funnel made out of a snakelike length of white fabric to encounter a TV set, on which a man holds forth on Singapore’s “world-class” attributes. “We are a world-class city, we have a world-class economy, we have world-class facilities . . . ,” he drones. Tunnel vision, anyone? As we leave the installation, pale pink badges catch our eye: They are printed with tiny globes sprouting wings. Undoubtedly, Lee’s exhibition at this government-funded institution is in tune with Singapore’s bid for global recognition as a cultural force. After years of looking askance at performance artists, the powers that be are now feting them in mainstream museums. Apparently, Singapore’s “world-class” politicians feel the need to vote for liberalism—at least when it comes to the arts. Still, for me (a Singaporean who has long since flown the coop) the best part of Lee’s deliciously provocative show is the fact that he is getting away with it.